Freeport, Illinois is a small city of just over 26,000 in northwestern Illinois. Because Freeport is only 30 minutes from Rockford, its retail offerings are eclipsed by the better variety and volume found in Rockford. The retail strip which does exist is mostly on IL 26 (West Ave) on the southwest side of town. Here a shopper will find strip malls and chain restaurants galore, including a JCPenney and a Sears. This area would have been a great site for an enclosed mall at some point, especially considering Freeport’s population has been steady at 25,000 since 1930. 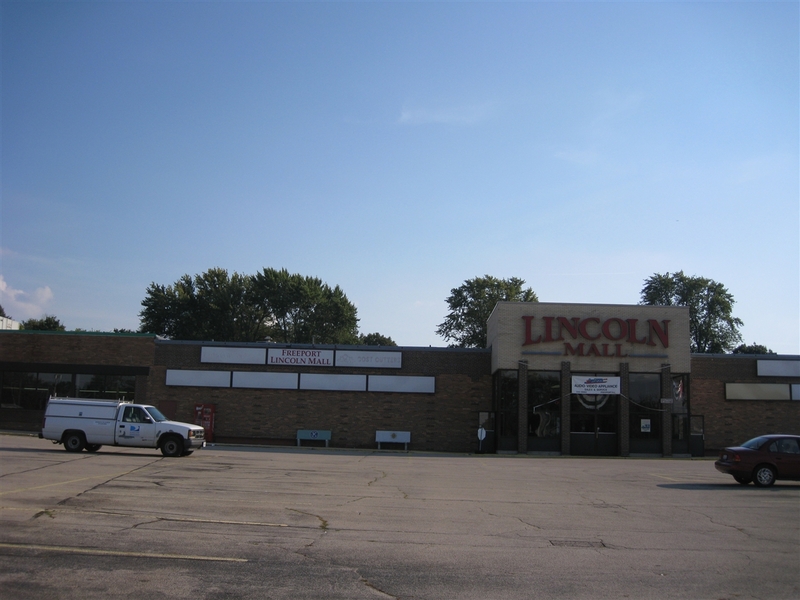 Instead, developers did build Freeport a small, enclosed mall of 186,000 square feet along West Galena Ave (US 20 Business), in 1965 and named it Lincoln Mall, which is appropriate enough as the famous Lincoln-Douglas debates took place downtown. And it has not changed since…well, the structure anyway. Certainly, the anchors and in-line stores have come and gone. Unfortunately, though, they’ve mostly ‘gone’ – away, that is; the last store open inside the mall is locally-owned Degrote TV and it’s right by the main entrance. Earlier in 2008, the mall’s east anchor Menard’s moved to bigger, brand new digs with all the rest of the strip fodder down on S. West Ave. The very large west anchor is currently vacant. It was most recently a Big Lots, but what was it before? Also, a small Dollar General is appended onto the mall structure on the west end, past the former west anchor. The indoor portion of the mall is bleak at best, and the smell can only be described as a wet, musty basement. The small corridor featured a fair amount of store spaces, 18 to be exact, between Menards and Big Lots, all of which are dark. From labelscars and stickers I could tell that one of the largest spaces back here was Ben Franklin, and another store had cedar shingles. This place has clearly not been touched since 1965, and that’s amazing. I think Mr. Lincoln might be a little upset, though. So, back to where we started. This website, which indicated the mall has been de-malled and recently rehabbed is apparently ill-informed. I certainly hope they’re not marketing the mall under false pretenses, and that there really is a TIF district established to “help this center grow”. I hate to be skeptical, but there are some really blatant lies there. Anyway, let us know more about this mall. What were the original anchors? What were some of the stores over the years? We visited Freeport’s Lincoln Mall in Summer 2008 and took the pictures featured here. We thought we’d immortalize it before it disappeared without a trace after 40 years. It is my understanding that there used to be a Charles V. Weise (Bergner’s) in Freeport. The Big Lots looks like that may have been it. 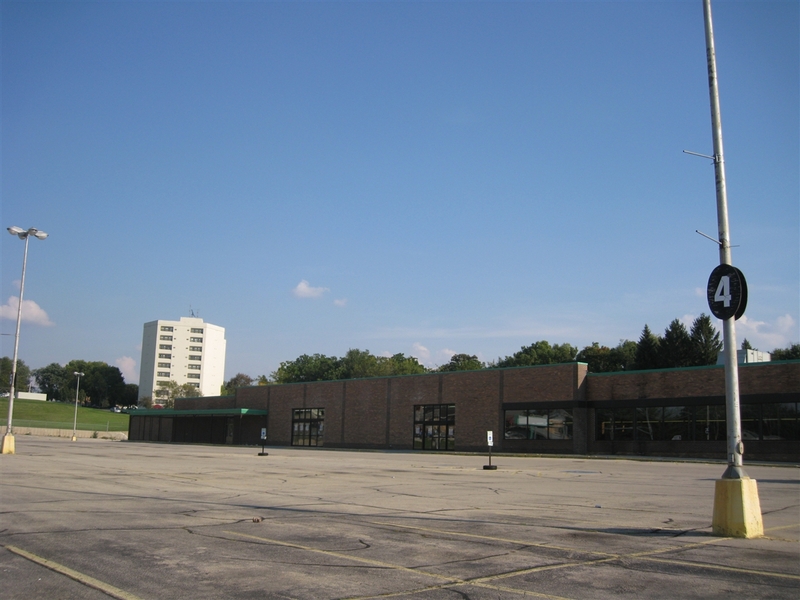 It looks similar to the Bergner’s at Northland in Sterling, IL, which was a Charles V. Weise. The former Menards at the other end of the mall reminds me of a small-format Montgomery Ward. Thinking of which, anyone know what the JCPenney at Northland in Sterling used to be? Looks like some sort of discouter at one time (~100,000SF max). Actually, in the 70s that mall was really booming. Where the Menards was located was a Sears. The opposite end had JC Penney. The was a large Ben Franklin, Garrity Drug, a travel agency, shoe store, Hallmark, Radio Shack, and very nice women’s clothing store. Was about the time that Cherry Vale Mall was opened that Lincoln Mall started losing out. Penneys was the first to leave quickly followed by Sears. Once the anchors were gone didn’t take long for the mall to start dying. That’s a pretty miserable looking “mall. I don’t think the asking price is worth it unless it includes the entire surrounding area. I’m thinking that there has’nt been too many modern chain stores in this mall (like GNC or anything like that) at all. The facades are too old looking to have housed any recent stores like that. this place could easily be a set location for a horror movie. by the looks of it they would not need much set prep to inspire a gloomy location. another great post, prangeway! According to that link, poor Degrote is on a month to month lease. While somewhat-struggling malls seem to be getting turned into mixed-use residential/retail locations, would it be that far-fetched to imagine a virtually dead center like this being converted into strictly residential (with each former store becoming an apartment), but maintaining a mall aesthetic, with planters, fountains, etc.? I think that would appeal to younger people with a sense of irony. At least parking would be ample. It would make sense if it was Weise’s/Bergner’s. However, Wikipedia says that the Weise’s was downtown and closed in the late 1970s. Hmm. Anyone know for sure? Previous poster is correect that the Weise’s was in downtown Freeport and closed in the 70’s. Lincoln Mall was never a rousing success. In the 1967-71 era, the anchor tennants were Sears and JC Penney’s at either end of the mall, with Garrity’s Rexall Drugs as the major tennant in the middle. Because Garrity was a local franchise, they stuck it out longer than most would have. In the late 1960’s, the “West Galena” site on US Hwy 20 where Lincoln Mall was built was definitely a hotter real estate location than the area along Illinios 26 (S. West Avenue) where the strip malls have since located. At that time, there was a discount retailer (Zayre’s, at one time, although it changed hands a couple of times), and a couple of grocery stores. Then “Farm and Fleet” opened closer to Yellow Creek, and Eagle Foods on the corner of South Street and Illinois 26. But retailing in Freeport has suffered since the 1960’s, when an ill-conceived attempt to revitalize downtown shopping led to the creation of an “outdoor” plaza on Stephenson Street that made it impossible to park, cold in winter and hot in the summer. Competition from Rockford was never the cause of Freeport’s retail failures — the Hwy 20 bypass, the downtown plaza, and Freeport’s resistance to anything new share that blame. Besides, the best shopping in Rockford since the 1960s continues to move to the far east side of Rockford, too far for “daily” excursions from Freeport, and never enticing enough for major purchases. Why stop in Rockford for major purchases when the suburban Chicago malls (Northbrook, OakBrook, Schaumburg) aren’t that much further away. Even Madison, Wisconsin is an easier drive, than the east side of Rockford. .
Brandon, I have the JCPenney at Northland Mall as being a JCPenney since at least 1985. My first guess would be Woolco. If you could get a pic maybe I could tell for sure, Woolco buildings are pretty easy to spot. At least it stores, chain stores at that! Oh, wow, two posts in two days! Keep ’em coming! The overall size of the mall interior reminds me a lot of the old Westfair Mall (which was in West Bend WI), which ‘was’ de-malled way back in 1993. I’m usually a fan of vintage appearances, but this one’s in need a total top-to-bottom remodel. No, more like an outright tear-down. I wouldn’t want to think of all the nasty junk between the walls and in the ceilings. Not to forget leaky roofs, possibly faltering electrical and HVAC setup. And I looked at that document. I tell you, Lakeshore Mall in Manitowoc is just as empty as this mall, and it’s in MUCH better shape, and when it last sold to new ownership for $2.9 million (last I checked)….not only is that a better deal than this mall is, it’s also more structurally sound, while THIS mall looks like it’s about to fall over. There’s also an unrelated mall in Matteson, IL called Lincoln Mall….don’t get the two confused!! Former Freeporter, which was Penney’s and which was Sears? I’m guessing Sears was Menards and JCPenney was Big Lots, judging from the size. Bobby, judging from the compararive bulidings, the former Menards was definately the Sears, and the former Big Lots was the JCPenney. JCPenney tended to have a false second level toward the front of the store until the 1980s. And this Sears looks to have had an attached auto center on the side away from the mall. Not uncommon for Sears of the period. My guess is that Penney’s either had a very small detached auto center or it was a dry-goods only store. Never would’ve guessed at it being a JCPenney as they have a store on the south sode of town along IL-26. Yikes!!! Look at the floor in this dump! And everything else! I’m surprised there hasn’t been a lot of criminal activity going on in there…or has there? Anyone know? I’ve always wondered what a ‘dry goods only’ JCPenney was? My guess is that it only had the ‘hardline’ stuff, no apparel or anything. Wards and Sears did the same thing in some markets, putting only so-called ‘catalog stores’ inline. Penney’s used that ‘false second floor’ heavily, especially during the time they used their ‘new look’ “Penneys” banner. This was a nice thriving mall at one time…thru the mid to late 70’s. The JCPenney’s was not a dry goods store. Previous posters were correct – the Sears was in the Menards location. The JCP at the big lots location. The JCP simply moved to it’s current location. Menards also moved to a new location in town. This is true for several of the stores that were there at one time. The parking lot is risky to drive your car in it is so full of huge potholes. I recently (2 weeks ago) went into the remaining DeGrote store and when we walked into the building, the smell of must/mold literally made you step back. Truthfully I am surprised it is not condemned. And as far as a recent rehab??? I can’t imagine what they are referring to. The building with the Dollar General carved into the side was most definitely a JCPenney. It’s a little watered down with the cheap looking front canopy, but it has the classic mid ’60s facade massing. Another charming feature of this mall is the abandoned upper level parking lot behind the former Menard’s building. Its accessable via a ramp up from the main parking lot, but it evidently has seen no use for a LONG time and is choked with weeds. I like the parking lot lights though, good catch on the lesser known defunct Ben Franklin store. this mall had wooden shingled roofing over the stores????? THAT’S RARE! 5th picture reminds me a bit of the Naugatuck Valley Mall in Waterbury,CT. Steven Swain, Dollar General isn’t in part of the old JCP according to the lease plan. I visited this mall on November 25, 2008, with my friend and business partner. We did indeed observe that the musty smell was evident near the entranceway, but not throughout the entire mall. The mall is still basically in the same condition it was in the pictures posted here. The DeGrote appliance store remains open, amazingly. Another former store is being used as a storage area for cleaning supplies and whatnot. We were unable to determine what store used to exist in the space that features a tacky facade adorned with wooden shingles. One item of note is that one of the former stores now has a banner hung above it that reads “Pretzel City Horseshoe League.” From the signs posted on the steel gate, we gathered that there is indeed a horseshoe league that meets in that spot one weekend per month. It’s amazing how the internet works – I was looking for something unrelated and this site happened to come up in my search. Since I’ve lived in Freeport for over 20 years I thought I would try to fill in a few gaps. The Lincoln Mall was mostly occupied when I came here in 1986, in fact is was THE major retail area outside of downtown. Sears and JC Penney were the anchors, along with the locally-owned Garrity Drug and Gift store, Radio Shack, Ben Franklin Crafts, several clothing and shoe stores, a travel agency, beauty salon, and a small cafe. I can’t recall the entire list of stores, but as you can see, there was a pretty decent selection and it was quite busy. Back then certain retail locations were set up to handle payment of utility bills, and Garrity saw a lot of traffic for that reason. 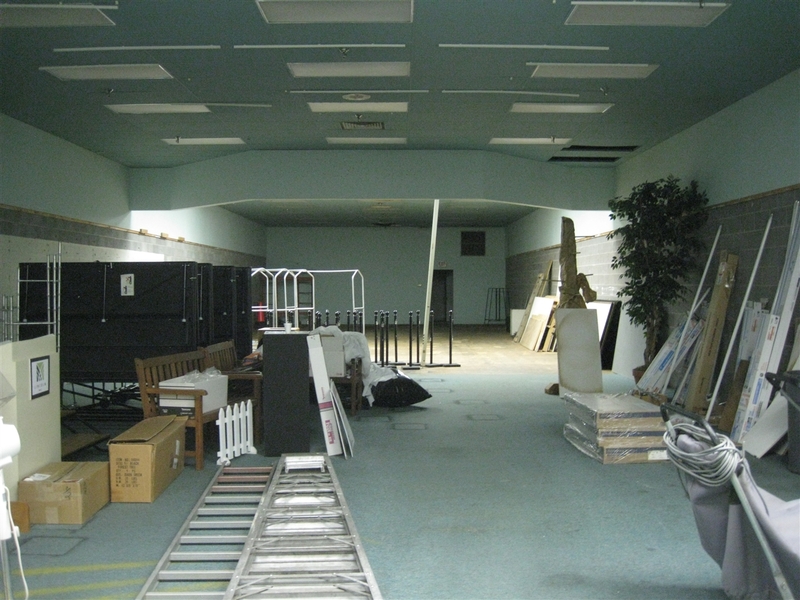 The interior mall area was often used for community events like bake sales, fund-raisers, exhibitions, kids performances, etc. 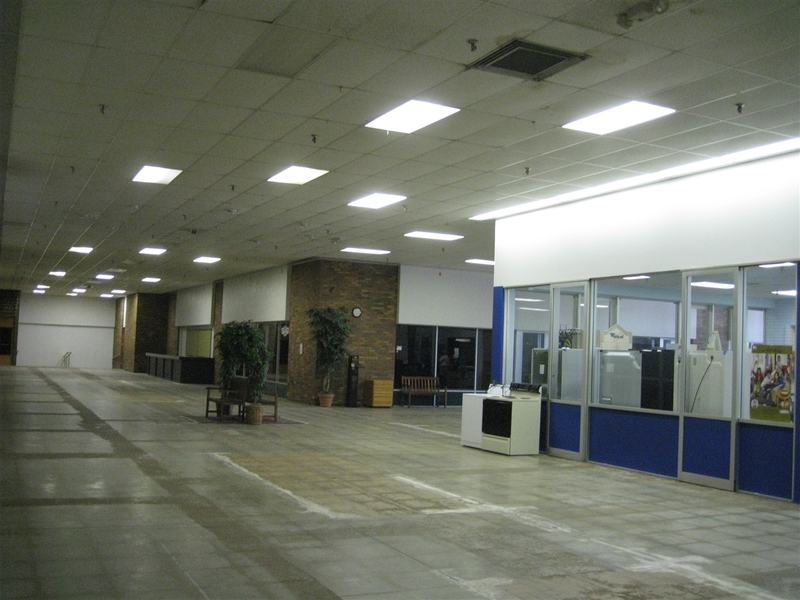 When the Meadows Shopping Center was built on south Rte 26, Penneys moved, and Sears was basically coming apart at the seams around that time, so they closed the full-line Lincoln Mall store, but opened a small catalog-tool-appliance outlet in the Meadows center. The arrival of Menards was much welcomed, even though it only carried a subset of merchandise and limited lumber and building materials. The first occupant of the old Penneys site was a Heilig-Meyers furniture store – they also sub-divided the space but closed after a few years when that chain went out of business. The space was empty for some time before Big Lots came in, and after a few years, left as well. I remember when Menards first opened, they maintained both a separate entrance and the one opening on the mall, but as mall tenants left that was closed off. That’s what I can remember – I’ve made hundreds of trips there and when it was full of stores and people, I never really noticed it being especially tacky or outdated, but then I’m more on function than style. The owners have maintained a local caretaker-manager (a neighbor of mine) who I’m sure would be able to answer any questions. For $64,000 – I can’t recall which store(s) had the hokey wood shingling, but it might have been a Thom McAn shoestore and Radio Shack. With that said – I’d like to pose a question to the retail gurus here. I’m a business development consultant (industrial, B2B, not retail) and have pondered what could be done to re-purpose the Lincoln Mall. Remember, this is a city of 26,000, not Chicago or LA, so the possibilities are limited, but perhaps more creativity is possible. As I see it, the owner will have to pay the property tax and other expenses ad infinitum, whilst the place continually declines in condition (and value). What options might exist other than plunking down $3.5 million, or a significant fraction thereof? What legal structures might enable creative re-use through perhaps through public-private parternship? To my mind, the value lies in what it could become next, not in trying to return it to the retail mall it once was. And while it’s easy to poke fun at the Lincoln Mall (and I’m not here to defend it) – look at the list of former tenants who are either dead and gone, or have gone through their own tribulations. This tells me that retail is a tough biz no matter where you play. A very interesting blog. Truly a study of “modern history”! 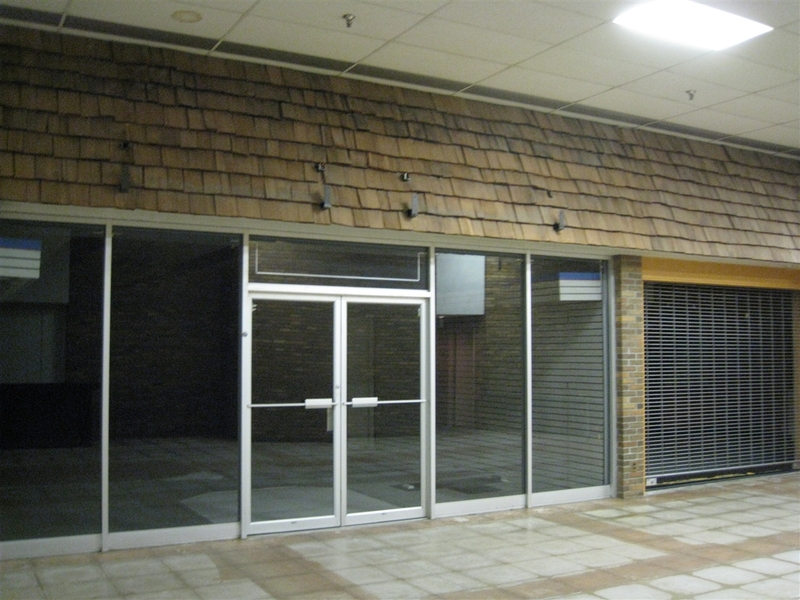 The shingled area was the former Radio Shack on the left and a beauty salon on the right. I grew up in Freeport in the 80s within walking distance of the Lincoln Mall. I spent lots of time in Garrity Drug reading pop magazines and buying candy. My friend’s mom was a pharmacist there. When I was much younger there was a candy store across from Garrity’s. The diner was called “The Lincolnette.” The Penney’s store became a Spurgeon’s for a while, which used to be downtown. There was once a Hallmark near the entrance of Menard’s. Every year for Easter there was a large egg-shaped incubator in the mall walkway with live chicks. 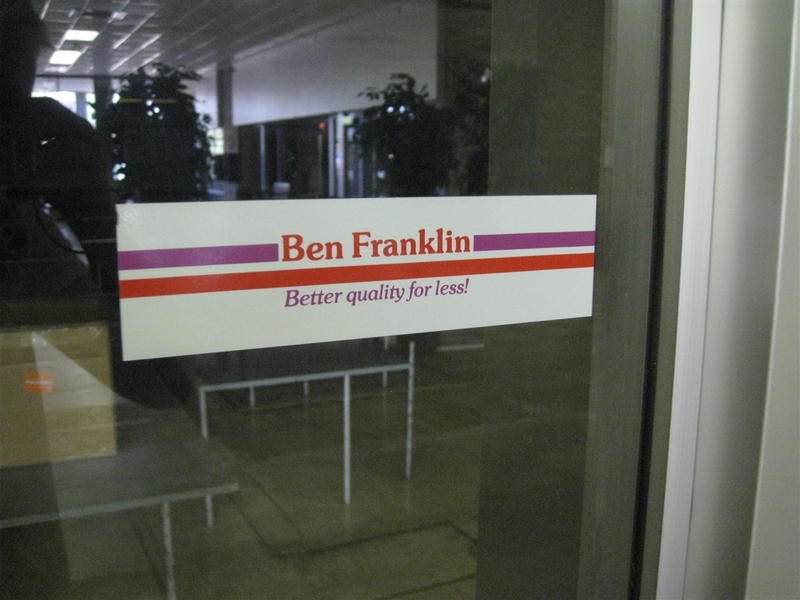 I remember thinking of the Ben Franklin as new, but I can’t remember what was there before it. Thanks for the opportunity to reminisce! I was back in Freeport recently and learned that a favorite lunch destination, The Garden Deli, is moving (or has moved) across the street to the Lincoln Mall. They have enough of a dedicated clientele (me included) that I think they will be successful. Maybe their success will revitalize the dying mall? I have grown up in Freeport and I would like to add my two cents in by saying that with Garden Deli as well as Degrote there the Lincoln “Mall” might survive as long as people are willing to give it a second chance. I would LOVE it if it was up and going again. The musty smell was not evident when I went through about a month ago, or I may not have paid attention to it. Now the East End of the Mall or should I say parking lot. Huge Tall wall at the end of the mall where the ramp went up to the upper level. Property above the wall towards Harlem Street was the long gone King Daughters Home. Back to the wall. Has some sad history, Late one night a guy on a motorcycle stopped and folded his leather jacket, placed it n the ground, got back on his bike then full speed ahead and hit the wall. Back then hardly anyone worn helmets so needless to say he killed himself. It would be nice to see something done with it but will all the moving to the south side of town and the bypass around the North end of town the traffic just isnt there anymore. I can also remember walking down to the mall while it was being built with the guys and playing in the construction site. I grew up across the street from the mall and like you worked at the Eagle store and the Sugar and Spice. Was Owned by Dale Otto. I remember as a child going across the street during construction and selling Kool Aid to the workers. I think the musty smell comes from the basement of the building because I use to play in the basement during the construction and it had a moisture problem. There is a natural springs running under that area because as a kid we use to drink from them. So many memories and it was a good neighborhood to grow up in. Thanks Jeff for bringing back the memories. Did we know each other? anyone know what ever happened to the scale modle of the Lincoln Mermorial that used to be palced center court of the mall?? Where is this at in freeport? Is it still open? If we all supported the mom and pops, this wouldn’t have happened. Now, many people live a lower standard of living because of shopping at multi-national corporate entities that owe no allegiance to any community much less country. It wouldn’t take that many of us to buy U.S. and support U.S. businesses to make a change where Main St. rules instead of Wall St. Sorry to say, but shopping at Walmart is only going to keep the status quo, sending jobs and money out of our country. Vote with your dollars folks. They may not seem like much on their own, but added up, it can make a huge difference. We can have community again like we used to and decent pay along with it. I was manager of the downtown Woolworths in Freeport back in the late ’80s when the downtown was a walking plaza.The downtown was quite viable then with a Jupiters variety store,Walgreens,Spurgeons,and many other stores in a very full downtown.Lincoln Mall seemed small back then but was full.Freeport definitely grew away from the mall and the downtown is a shadow of its former self.I live in Sterling where I grew up.Penneys was the original tenant in Northland Mall when it opened in 1972 but it was a new concept back then thus its unusual look,it now looks pretty much like any other JCP.Northland Mall also had a large Woolworth in its center. Bill is correct RE Penney’s at Northland Mall/Sterling. It opened November 1972, a few months ahead of the rest of the mall. It had checkouts along the front, like a discount store — it looked much more like a discount store than a traditional department store. There was a similar-format store in Carbondale, IL — those were the only two I’ve ever seen. When the rest of the mall opened in spring 1973, the other anchors were Weise’s (now Bergner’s), Woolworth (with a restaurant) and Walgreen’s (also with a restaurant). The Freeport Lincoln Mall is doing well now. There was an article in the Journal Standard about the mall. There are 7 businesses in there now with 2 more on the way. Sears (east end of the mall) and JC Penney’s (west end of the mall) were the 2 anchors. Inside there were many great stores that sold clothing, jewelry, records, a couple of hair salons, drug store and a gift store. After Penney’s and Sears moved out, Menards moved in where Sears once was and Heilig Myers Furniture was in where Penny’s was. Heilig Myers moved out and that’s when Big Lots came in for several years. Slowly, but surely it is coming back to prominence. We can’t let the corporate giants take over. Jim- your enthusiasm should be commended. But I am not sure you can polish a turd. I hope the mall does well, that side of town looks awful with the lack or commerce. Better eat your words and change your whole story and revisit the Lincoln Mall in Freeport. It is beggining to thrive again. Center mall has a deli and other stores now.Where Penny’s originally was along with their auto store Now(garrity health care) is a New big hardware store laid out much better than Menards(they do not carry l;umber. Easier to get to no big hangups in traffic. There used to be a hair salon,Radio Shack(I think that may have been the shingles on it) Ben Franklin store, Garrity drug store.I beleive there was also a shoe store. I am not sure but I am thinking there was also a Jewelry store as you went in the main Entrance. Stores are repainted , refurbished and look great. So, you may wish to redo your article. The Owners did this on their own……. It’s good to know that the mall’s coming back. Sometimes you just have to give it a chance and with the economy slowly getting back on track, I think this mall is going to be alright. Thrive????? A dumpy little sandwich shop and hardware store does not constitute thriving. I want the mall to do well myself, but until you add stores that bring all demos, you will continue to have an awful mall. I spent 15 years in Freeport, until graduating from FHS in the late 1980’s. I remember a record store at Lincoln Mall until the early 1980’s called “Sound City USA” (I think!). What was cool about it was it was the only music store in Freeport (unless you count “The Barn” in downtown Freeport.) Remember “The Barn”?. It was like an old time “head shop”. It was where we would go to wait overnight to buy concert tickets for concerts at Rockford Metro Centre. Also I remember the owner always had a big dog at The Barn. Sorry! I know this is supposed to be about the Lincoln Mall, but it brought back many, many interesting, eventful memories. I too apologize for straying away from the main subject of malls but I wanted to thank you for mentioning The Barn. I worked there for most of the ten years it was open and your comments made me long for the “good old days”. Thanks again. I haven’t lived in Freeport for over 25 years. While I was back visiting a couple of years ago, I had lunch at the new Garden Deli in the mall and really didn’t notice anything out of the usual smellwise. The hardware store took over the Big Lots area. the Menards (Sears) is still empty. Also I think Spurgeons was the first store after Penny’s, They divided the store and Spurgeons had the mall side ad Degrote was actually outside the mall in west end of the Penny’s store. (Degrote’s actually moved to the north side from the south side) Degrote wanted the old auto center of Penny’s for car audio installs. Does anyone remember the JC Penney record and music department that used to be in Northland Mall in Sterling, IL? If so, do you remember the name of it? It was contracted into the store. It was when the mall was new and JC Penney moved in. About 1971-1973. I don’t remember that separate music dept.I remember that JCP had a restaurant in the back corner which I have never seen another Penney’s have.There was a Red Carpet Stereo in the mall and Weise’s(now Bergner’s) had a separate music dept. as well as Woolworth. I was just told by one of my co-workers who happens to be from Freeport today that it appears that new life has been injected into the dying Lincoln Mall. She was visiting home this past weekend and according to what she said, a good number of vacencies have just gotten filled up in there. Does anyone have any new info about those as well? Yes, the Mall has some life back into it. As told in the articles above, yes the Mall is coming back to life. Presently, It has filled up nicely with the Garden Deli moving from it’s location across the highway, into the Old Garrity Drug store, within the mall. The interior of the mall has a new ‘painted mural’ on the floor running down the main corridor and spilling left and right toward the other store fronts. 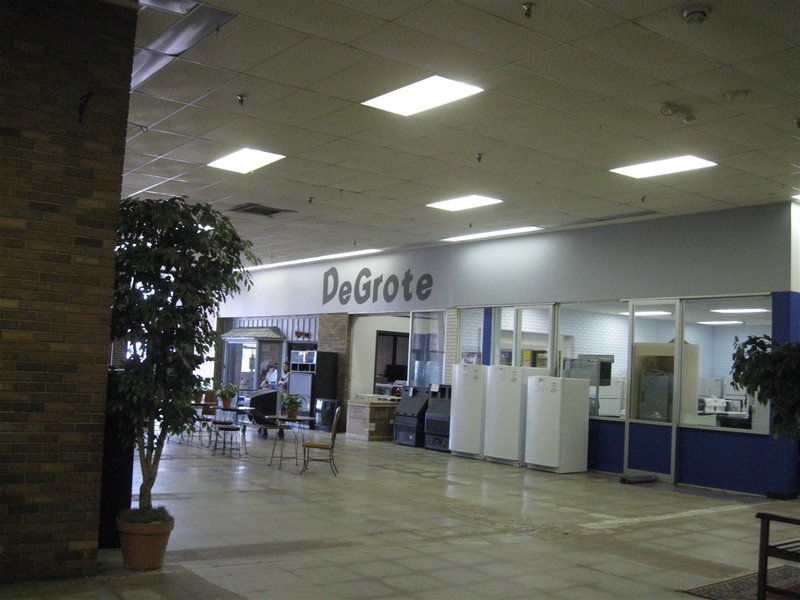 Degrote TV is still in the mall, occuping space where the Yum Yum coffee shop used to be located, Then later where a travel agency used to be. Voices, which is a domestic violence help group is across the way, next to that to the left is a used bookstore. I think the Senior center runs the bookstore, but I’m not sure. The Senior center also offers help to Seniors for most general things. There was a small cafe across from the Senior Center, and next to Degrote, but I am not sure if that is in there anymore. On the other end of the T, on the right, I think there is a travel agency; a tanning bed business; a video gaming center(were radio shack used to be); a used Bridal gown shop called Once Upon a Dress, and a hair salon, called Tangles. Where Penny’s used to be is Home store called Best ….. something or other. It is a larger version of say Ace Hardware. Just a bit of history of how this started coming together, When Home Extreme Makover did a house to the west of Freeport on Route 20, They used the mall as a drop on and off spot for tourists coming to see the house while it was being made. The Garden Deli was really the only store in there besides Degrote. The visibility of the Mall and the potiential for businesses really took off after that. My past memories are extensive, as I used to work in the Yum Yum shop all during my school years, my sisters and brothers and Father all worked there part time in the other stores. I grew up down the street on Crestwood Drive a few blocks away. I remember when it opened, and they had a huge statue of Lincoln, that we all climbed up on its lap and touched Lincoln’s nose. It is a sad story about the mall, but it is nice to see the parking lot filled again, and the Garden Deli is still the best sandwich shop around, so if you get in the area, stop on by. I also grew up in Freeport having lived here from 1976 to 1990. 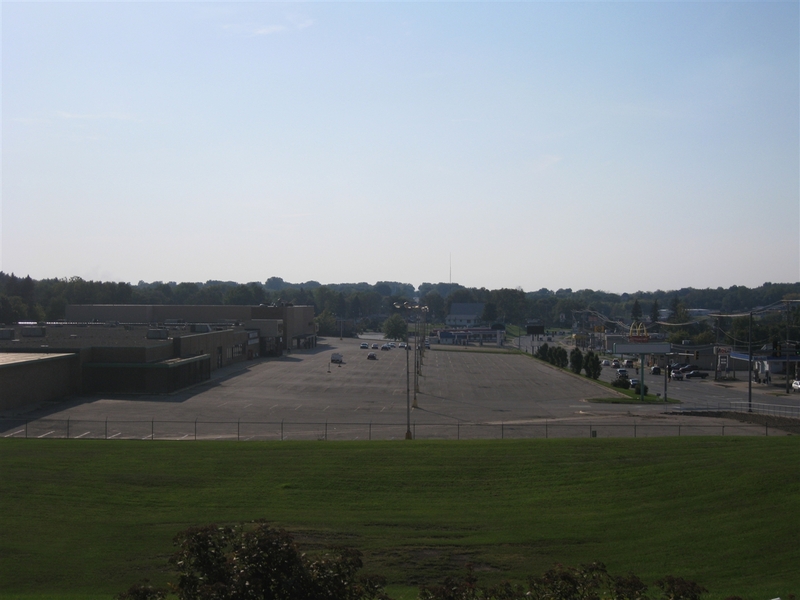 Here are a few things that haven’t been mentioned: Back in the day, you couldn’t find a parking spot at the Lincoln Mall. Across from the mall was a Lee’s Grocery, original Kentucky Fried Chicken, McDonalds, Mister Donut, and Kelly Tire store among others. This was a very happening area of Freeport and all indications that is was improving when the new Jewel Osco opened even further west of the Lincoln Mall (I think in 1983/84?) The Lincoln Mall was the location of Santa’s workshop every year, also seasonal displays and events in the lobby. The candy shop was called Ray’s Candies and Ray himself, an older man was always behind the counter, I believe the Scotts 5 and dime (later Ben Frankin) was originally a TG&Y in the late 70s, early 80s. Next to Sears was Iron-T Junction and was one of the few places in town where you could order your high school letterman jacket. 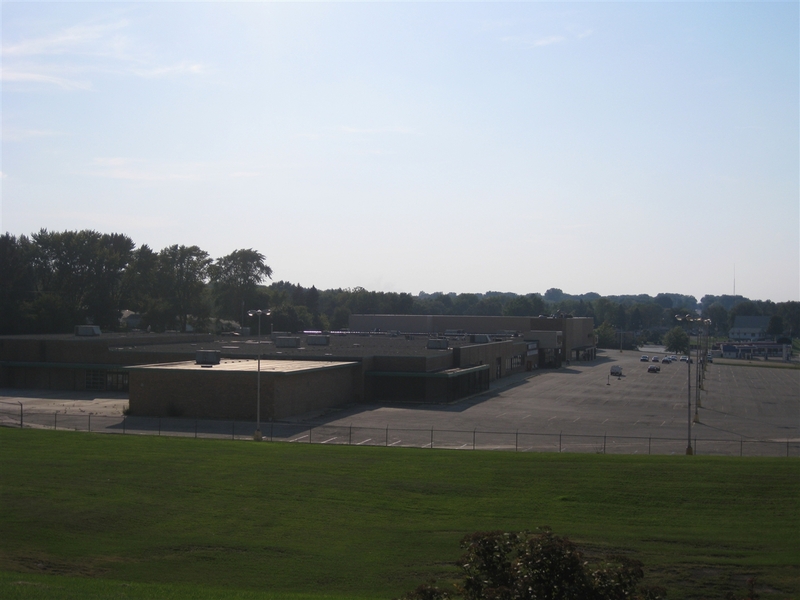 The mall was built on the edge of a flood plain that extends north to the Pecatonica River. (that’s the reason for the 5 to 10 foot high parking lot, which you can see driving down Galena). Nice work on the Mall comeback! It is a special place, in any condition. And here I was just trying to remember the name of BigLots! Interesting. I grew up in one of the many rural areas and villages surrounding Freeport. We looked at Freeport as the center of commerce – the big city. For a long time my youth, my mother refused to drive the car there because there was “so much traffic.” Once a week we trekked into town to run errands, stock up on groceries, maybe catch a meal. Eventually we moved into town. I was a teenager then and spent a share of my time at the mall. JCPenney held down one end and Sears (later Menards) held down the other and between them was Garrity Drugs, Garrity Gifts, TG&Y (then Ben Franklin), a video arcade, a couple of women’s clothing stores, a restaurant, and a tiny little jewelry store that had a lot of (from what i remember) cool things. For a good while the same businesses remained there and, other than downtown, were the main place to shop but –as noted– in the 80’s, JCPenney and Sears relocated their businesses their former locations were were subleased or released and/or subdivided to fit the needs of whoever could find the cash to rent the space and got enough customers to keep their businesses open. After that it was never quite the same. It is getting a bit better now. I think having G. Deli’s there now- a business that plays a regular part in so many people’s lives – gives the place a feeling of being real again. Less of a ghost town. It did feel that way for a real long time, but lately there is something more alive about the place. I think the mural on the floor of the entrance does something for the place too. The mall actually now has a voice book nook, a senior center, a tanning salon, a video game store, garden deli, degrote appliances which survived, and the salvation army store. plus a new bridal shop. It’s still not the kind of mall that you’d walk around in and window shop, but my 2 year old has a disability and has to learn to walk with a walker, and every negative thing about the place can be overlooked in my opinion, because the corridors are empty enough for him to walk around. I know that’s not enough reason to keep a business open, but my family would lose something wonderful if it closed. Plus, I agree with DarlaZ. The deli makes the trip worth it. As of Tuesday, June 18 2013, the owners of Lincoln Mall have filed for bankruptcy. While not a surprise, I must commend someone for keeping this mall operating non-stop since its opening. This is unfortunate, but does happen. Yikes! That’s never good news to hear, but especially when it’s dealing with owners of a property who were trying their damndest to keep it relevant. If I may ask, where are people in this town driving to? My hunch says Rockford, which is east of town, but who knows? People do so much online shopping nowadays, and for the folks who / were never really into malls, shop at Walmart and the like, which Freeport already has. Hopefully things can turn around. It really seemed like this place was turning the corner a few years ago too. I was very young, but remember this mall (1969-72). Always a little sad when a mall starts dying out. We moved to the Phoenix, AZ area & I grew up behind Los Arcos Mall in Scottsdale. 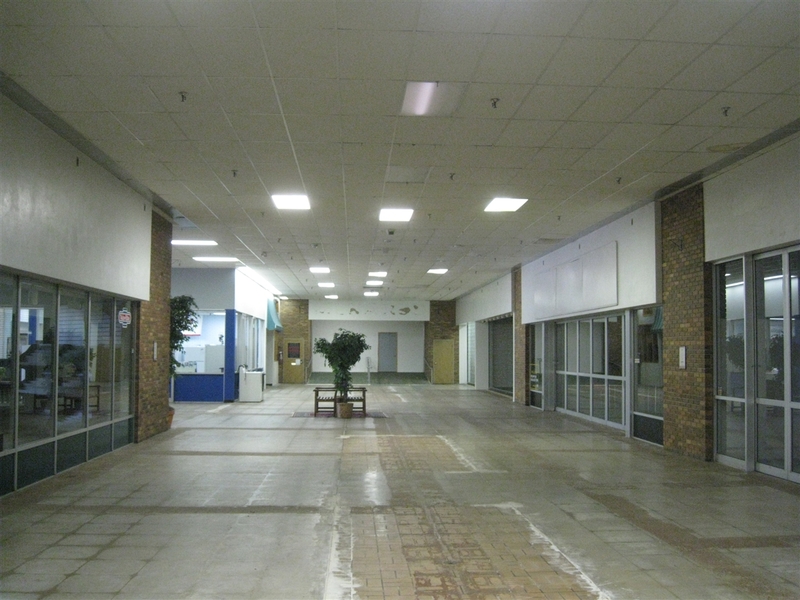 The Phx area has a lot of entries on Deadmalls.com. I was just there last week for my bi-monthly run to the Voices bookstore. 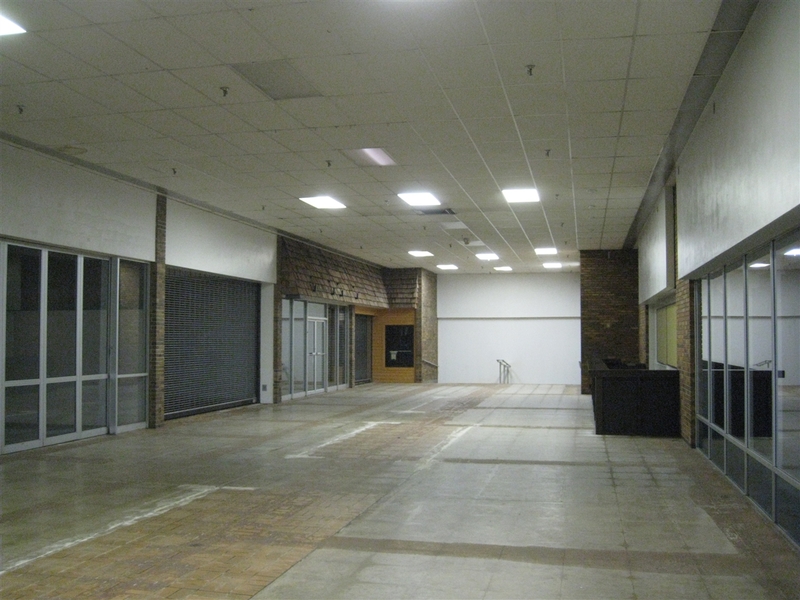 The mall is pretty bleak. Degrote, Voices, the hair salon, and one other business that is never open is all that is left. The roof over the old Menards, which housed Salvation Army, partially collapsed. The roof was repaired but Salvation Army left. Garden Deli left last month due to a large spike in the rent cost for the front they had. Do It Best which is located in the same strip is also closing down soon. I figure within the next year or so, the place will be empty. I live down the street now, but have lived in Freeport my whole life. 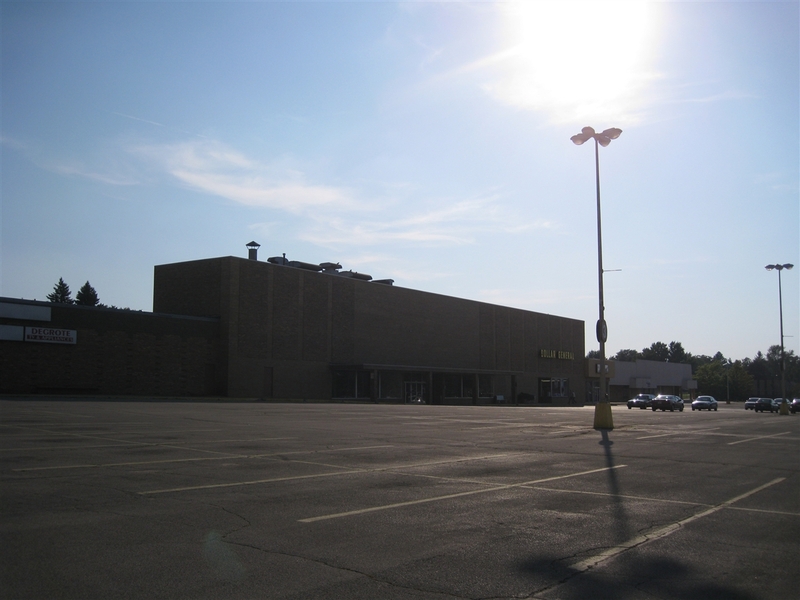 The mall has never been a great shopping area here if you shop in town at all it was either downtown or WalMart which is now and has been for a while now a super WalMart same with menards who was in the mall but is now on the south end of town with WalMart as a supercenter. Yes the hardware store which used to be big lots is closed now and along with everything else in the mall except degrote and a donut shop who is opening soon right across from each other. Habitat for humanity and dollor general are the only other two businesses left other than the two mall occupants left in the whole complex from the old menards to the old eagles so in my eyes it would be more cost effective to tear the whole thing down along with the unattached old eagles building and then you got land for possibly two big stores like target, khols, etc. Or better yet a new strip mall for outlet stores that would be more likely to rent a place with better appeal unlike now where you have 60s and 70s walls and doors that are outdated and unappealing. But have say this side of town isn’t dead has been getting better with this site being the only unappealing and vacant places left so why not do either a complete rehab or demo and rebuild the whole thing to be more modern than it is now that’s my idea about it but with the city shooting down any big business that wants to come here along with the bypass its not likely to happen anytime soon if ever what a shame and waste of a good location.